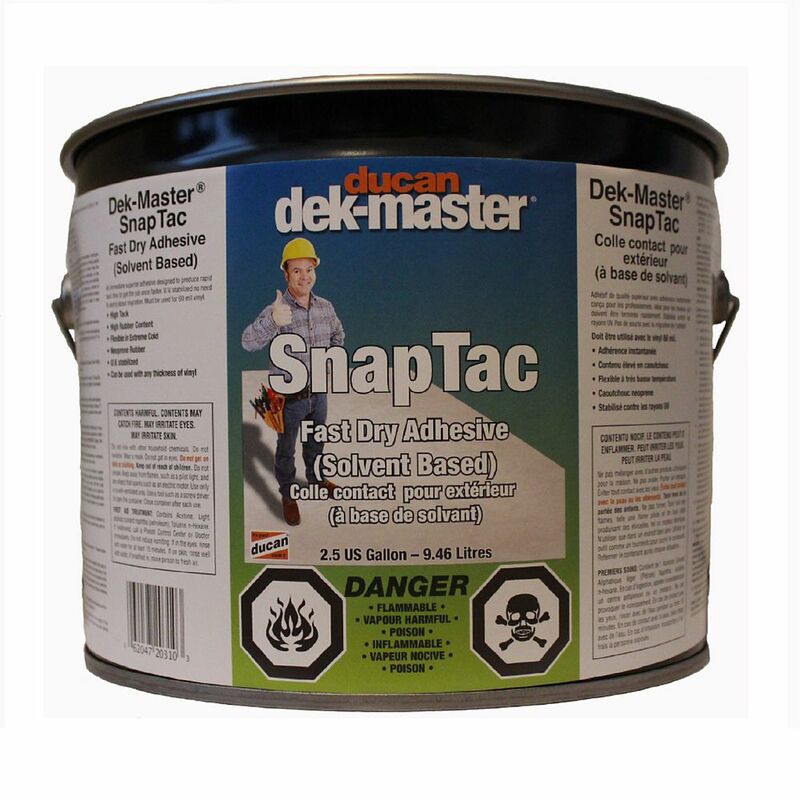 Ducan Dek-Master SnapTac Adhesive is a fast drying Adhesive used most commonly for 60 mil vinyl but can be used for any grade of vinyl. Ducan SnapTac Adhesive is a fast drying adhesive which can be used with any grade of vinyl but is the Adhesive of choice for 60 mil vinyl decking. It's fast drying formula accelerates application. SnapTac Adhesive can be used from 7 Celsius to 32 Celsius. Amazing Goop Amazing GOOP Marine (109.4 ml) / 3.7 oz. Amazing GOOP Marine is the only adhesive and sealant needed for outdoor marine use. It repairs, seals and sticks to a wide variety of materials with superior strength. Amazing GOOP Marine is ideal for stopping leaks in waders, wet suits, diving masks, rafts and air mattresses. Weatherproof and UV resistant, it wont crack or break down under stress. Use on glass, plastic, metal, vinyl, rubber, wood and more - Amazing GOOP Marine is the most versatile and effective adhesive available. E6000 Series E6000 Craft Adhesive (59.1 ml) / 2 oz. Amazing E6000Craft is a unique adhesive formulated to meet high performance industrial requirements, thus making it an excellent crafting tool. Amazing E6000 has exceptional adhesion to wood, metal, glass, fibreglass, ceramics, and concrete. It also adheres strongly to leather, rubber, vinyl and many plastics. Amazing E6000 dries clear and once cured, its waterproof, washer/dryer safe, paintable and safe for photographs. Instantbond is the fastest curing high performance cyanoacrylate adhesive superglue. When used together with the activator spray, bonding time is reduced to mere seconds, at an incredible 5000lb. psi bonding strength which is nearly impossible to break. What makes Instantbond so unique is its ability to cure in as little as 3 seconds, allowing you to use the fixed or repaired item immediately, No waiting for hours, clamping, taping or nails. It is not just simply strong glue it is an instant weld on demand, it's a whole new method of adhesion. Imagine the possibilities. Enjoy the freedom! Instantbond meets the highest industrial standards and bonds most dissimilar materials: wood, stone, metal, glass, PU, vinyl, leather, vinyl, PVC etc. SnapTac Adhesive is a fast drying Adhesive used most commonly for 60 mil vinyl but can be used for any grade of vinyl. Ducan SnapTac Adhesive is a fast drying adhesive which can be used with any grade of vinyl but is the Adhesive of choice for 60 mil vinyl decking. It's fast drying formula accelerates application. SnapTac Adhesive can be used from 7 Celsius to 32 Celsius.